eUKhost Review 2019: Is eUKhost a Good Hosting? EUKHost have been providing a wide range of web hosting solutions along with 24/7 technical customer support since 2001. Whether you want to run your own website or go with a fully-managed VPS, they have a number of plans for you to choose from. EUKHost started offering web hosting services back in 2001. That makes them one of the most consistent and experienced web hosting providers, and they were also one of the first to offer automated web hosting. Most of their data centers are located in the U.K., making them ideal for customers in the U.K. the rest of Europe. They offer a range of plans at affordable rates to cover most web hosting needs. If you go with EUKHost, you won’t need to worry about missing out on the essentials: you will receive a free domain (and unlimited subdomains), a webmail manager (with any plan), add-on SSL certificates, and more. Although EUKHostdoes offer certain web apps and integrations, this is one part of their offering that could be improved. cPanel is one of the best website hosting managers, period. It’s one of the easiest for beginners, while providing extensive tools for advanced users. Plesk, included in their Windows plans, isn’t very far behind. On the other hand, if you’re comfortable using WordPress, the one-click install WordPress hosting solution means you can just jump straight into your favorite CMS. EUKHost offersseveral web hosting packages to suit the needs of different types of customers. Their top-level web hosting plans are cPanel Linux hosting, Windows Hosting, Business Hosting, and WordPress Hosting. These are tiered according to the amount of disk space and the number of databases and domains you require. However, all come with unmetered monthly bandwidth. Business hosting is divided into Linux or Windows hosting, which both come with the same resources and a 100% uptime guarantee. WordPress hosting has three sub-plans that are very similar to the regular web hosting plans. 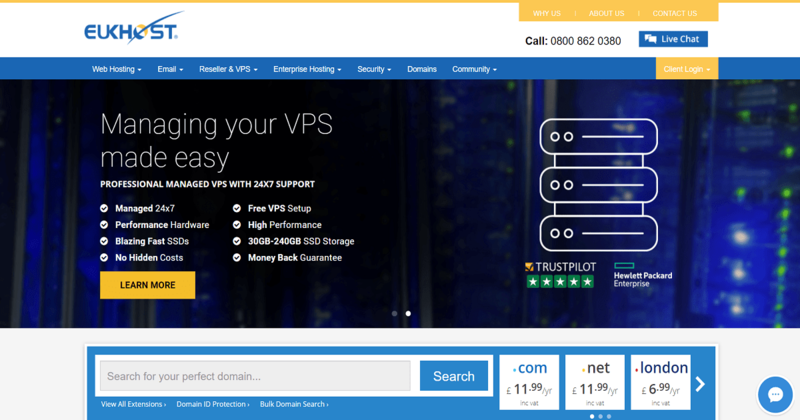 Lastly, there are Reseller and VPS plans, each with the option of either a Linux or Windows environment. There are no free trials, but all plans come with a 30-day guarantee and you can upgrade or cancel your plan at any time, subject to a monthly payment cycle. Another great thing about EUKHost is that all plans come with free 24/7 technical support via live chat or phone (U.K. phone lines are free of charge). There is also a user forum (although not very active) and an OK-ish knowledgebase. I received one error message while updating PHP versions. I tried the live chatand was connected with a support representative almost immediately. My problem was resolved promptly enough, but there wasn’t really any explanation or advice given. Although competent, hospitality is not their strong suit. If you require affordable hosting with flexible terms to serve a mainly E.U. or U.K. audience, then EUKHost is worth looking into, no matter what your performance needs are. They provide a wide range of solutions for normal web hosting, WordPress hosting, business hosting, VPS hosting, or reseller hosting. Wondering how eUKhost stacks up against other Web Hosting companies? Enter any other Web Hosting company and we will give you a side-by-side comparison.